MEK supporters in London, demonstrate regime’s inaction regarding the flash-flood. Supporters of the MEK, across the world, have been expressing their solidarity with the flood victims in Iran. On Saturday, March 30, protestors gathered in London outside the UK Prime Minister’s residence, Number 10 Downing Street. The protestors expressed their sympathy and condolences with their compatriots in Iran. They also expressed their anger and frustration at the regime’s response to the disaster. The People’s Mujahedin Organisation of Iran (MEK) revealed that the regime has deliberately misled the public over the death toll caused by the flooding. Heavy rain and extreme weather have caused widespread flooding across 25 of Iran’s 31 provinces. Roads, buildings, cars and tragically, people, have been washed away in flooding in Shiraz, Khorramabad, and Isfahan. However, the regime’s response has been muted. Instead of mobilizing the country’s resources to organize coordinated rescue efforts, the regime has attempted to deflect blame. The MEK’s President-elect Maryam Rajavi drew attention to the regime’s role in exacerbating the flooding. In a statement, she said, “they destroyed the channel that used to lead floodwaters out.” During heavy rain, this led to extensive flooding in Shiraz. The regime deployed the Revolutionary Guards (IRGC) and the Basij forces, but instead of helping victims, they were quelling protests, demonstrating that even in a time of national crisis, the regime will put its interest ahead of those of ordinary Iranians. Maryam Rajavi summed up the situation in another statement. “The disaster once again proved that the ruling mullahs’40-year policy of plunder and pillage has taken a heavy toll on the lives and livelihood of our people,” she said. In addition to refusing to devote adequate resources to the rescue efforts, the clerical regime has deliberately hidden the full death toll from the public. The MEK believes more than 200 Iranian lives were claimed by the catastrophe. “The delay and procrastination in helping those who are besieged by the flood have increased the number of victims,” Hossein Abedini of the National Council of Resistance of Iran (NCRI), the umbrella group of the MEK, asserted. In hiding the full extent of the crisis, the regime has prevented international aid agencies from offering sufficient assistance. 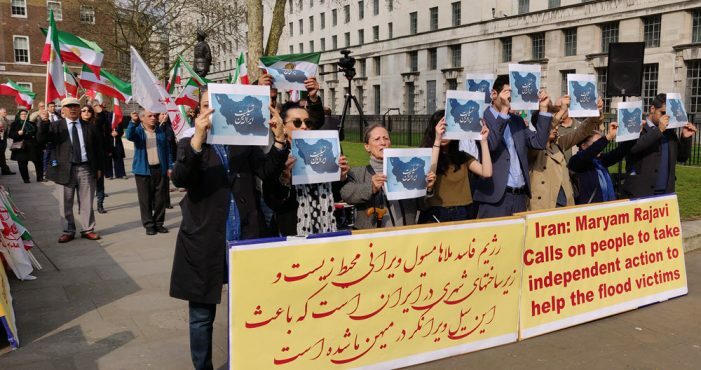 In their protest on Saturday, the Anglo-Iranian community outside Downing Street called on the UK government to condemn the regime’s response to the crisis and work with the European Union to pressure the regime to provide disaster relief to the affected areas. 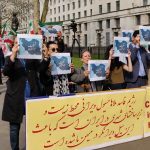 Several other prominent UK lawyers also spoke at the rally, expressing their solidarity with the Iranian victims and calling for a more “responsible” government.